The volumes of the building are characterised by severe geometry. A few square, linear elements are assembled to form a single compositional whole, in which everything is reduced to its minimal essence without giving in to the temptation of superfluity or ostentation, to a redundant image of vacuous beauty that would have ruined the final result. 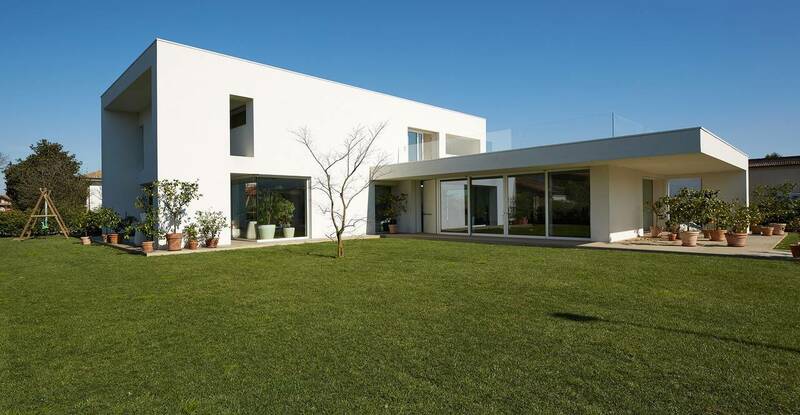 The single-family home in Piazzola sul Brenta, in the province of Padua, designed by architects Paolo Calderaro and Paolo Palmas of ArchiTecnO Associati, expresses a sober elegance achieved through constant control over the parts making up the architectural organism. 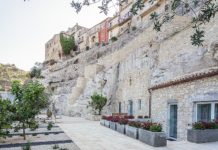 The newly built construction is composed of a volume on one level, ending with an overhanging roof which juts out and joins onto a second volume, on two levels, terminating in a big arcade on one side of the villa. These two intersecting blocks form a T-shaped floor plan, which determines the relationship between the living area and the bedrooms. Cement and glass are the only predominant materials. The large windows adding rhythm to the façade help lighten up the weight of the material component, letting light into the rooms and creating effects of transparency and opacity. This projects the house outwards, toward the space in which it stands, establishing a privileged relationship with this space and emphasising the permeability between inside and outside. All the elements in the villa communicate closely with one another, and glass plays a key role in this connection of spaces. The entrance, located at the end of a covered passageway, is also marked by big openings offering glimpses of the living room. This part of the home is made even more unusual by a light well crossing right through all the levels in the building. The architects use this expedient to allow daylight into all parts of the home, in a continual contrast of light and shadow. 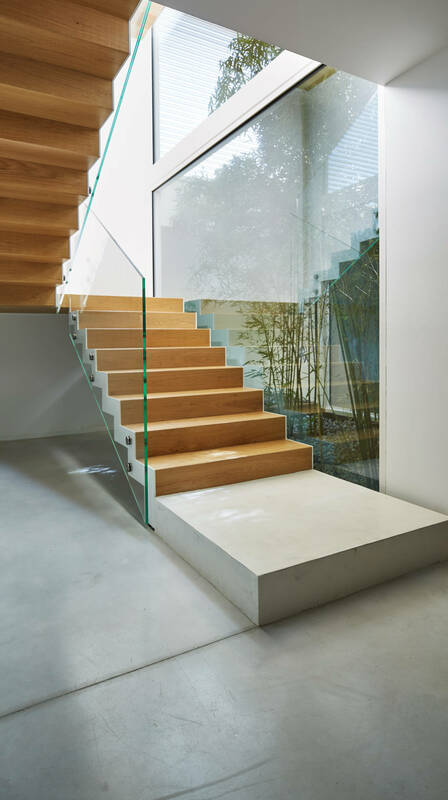 Glass returns to characterise the railing around the patio on the first floor, reducing its visual impact and leaving the view of the surrounding landscape unhindered. The distribution of space places the living room on the ground floor, with the dining room and fully equipped kitchen; the basement contains storage spaces, the heating system and the laundry and ironing room; on the first floor there are three bedrooms, each with its own en-suite bathroom. The master bedroom is particularly elegant in its minimalism, without any decorative additions. An open space, without any breaks or dividers, forms a relaxing wellness zone with the bathroom, lit up by a skylight on the roof. 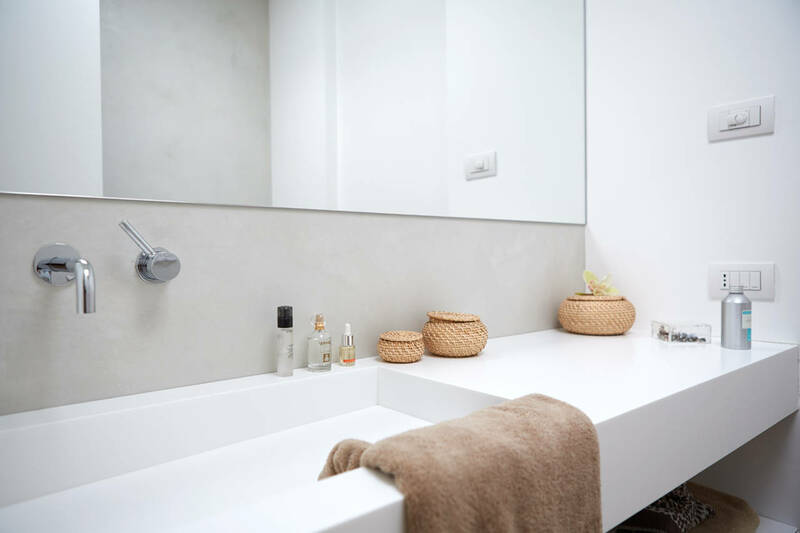 And in the middle of this space, between the Planit sunken bathtub and the bed, the architects have placed a floor-to-ceiling container unit; a filter which contains, facing one another, a toilet and bidet by Flaminia and a Corian® sink with a cabinet underneath it. The minimalism, cleanliness, and brightness of the interiors is underlined by Microtopping: an innovative cement coating produced by Ideal Work which adds refinement, material and chromatic continuity in only 3 mm of thickness. Cement changes form, from a rough to a noble material, offering infinite expressive potential. Microtopping is perfect for making unique new home accessories: ductile and malleable, with a high degree of adhesion, it can be applied horizontally or vertically to flat or curved surfaces. As Ideal Work's authorised installer, Luca Pegorin, confirms, Microtopping was recommended to ArchiTecnO as perfect for the simple, modern style of the home. 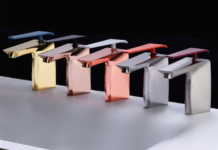 The final effect, pleasurable to look at and to touch, adds prestige to the contemporary design of the space. Beautiful and practical, Microtopping offers particularly high performance in terms of strength, durability and easy cleaning. Maintenance is reduced to a minimum and the material maintains its appearance unaltered over the years. 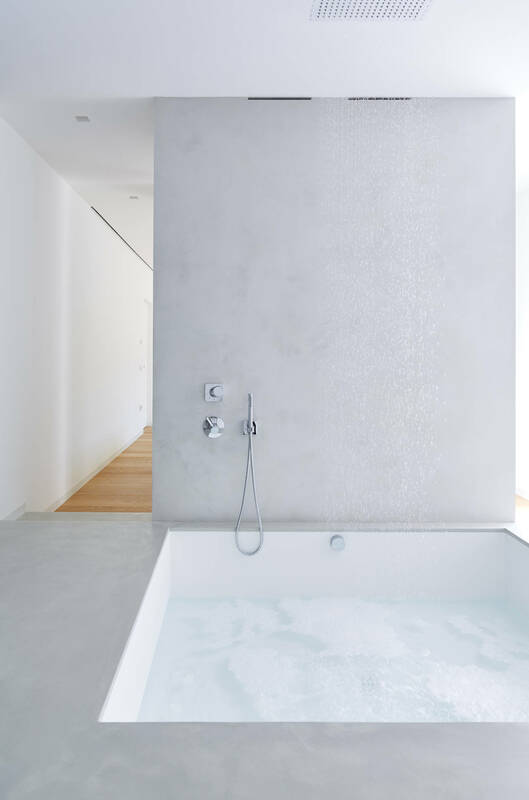 Used here in the colour silver grey, it appears in the most important bathroom in the home, where it entirely covers the big square bathtub - the focus of the entire space - in harmony with the wall-mounted shower, designed to be open without a protective shower stall, and the floor as well as the raised platform on which the bathtub is mounted. 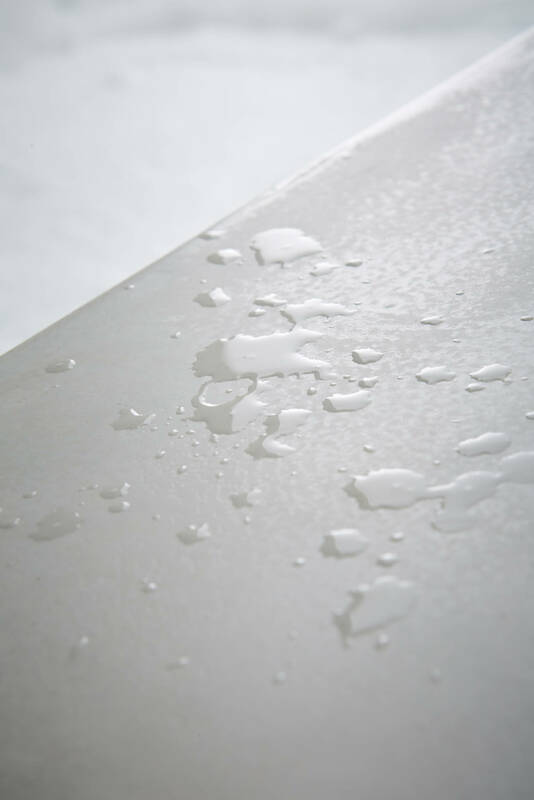 Because of the moisture levels in the bathroom, a water-repellent treatment has been applied to make the covering perfectly waterproof. These measures and the two architects' hard work created a wellness area where the absence of any interruptions in either the horizontal surfaces or the vertical partitions generates an optic effect of dilating the room's physical size, expanding it and creating an atmosphere of profound serenity. Microtopping is also used in two other bathrooms: in warm beige hues in one and fresh, restful lavender in the other. It also covers a walk-in closet with glass doors in one of the bedrooms. And to top off the project, the front door of the home is covered with white Microtopping.